British art store Art You Grew Up With is offering some limited edition X-Men prints for sale, to tie in with the launch of X-Men: First Class in UK cinemas. 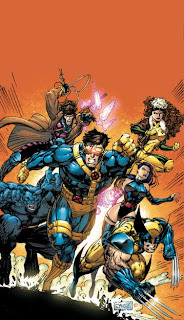 The selection of limited editions on paper and canvas by some of the hottest talent in illustration and comics today includes 'Visionaries', right, along with other images by Jim Lee, plus an 'Astonishing X-Men' piece by Simone Bianchi, and more. Beautifully printed, they're superb editions and comic representations although they don't come cheap - the signed 'Visionaries' print will set you back £565 unframed and £655 framed. (Other items aren't as pricey, though). Art You Grew Up With, which sells a wide range of art featuring children's favourites ranging from 2000AD and The Beano to Paddington Bear and was recently featured in the Express, is also offering Father's Day gifts of Harold's Planet cartoons and Simpsons art. Its prints are sold in a variety of stores across the UK as well as online. 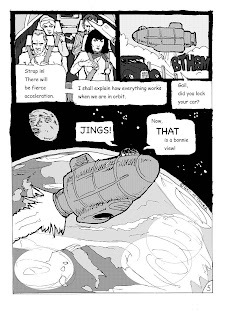 Fans of Dan Dare and 1950s space comics might want to check out this fun web strip by Mark Toner - Gail Scott, Space Pilot. Featuring a group of Scottish friends exploring space, the current adventure - "Who is Mr Mentor?" - finds Gail and chums (all broad Scottish banter kindly translated for dumb sassenachs) on their way to Mars in a futuristic spacecraft. 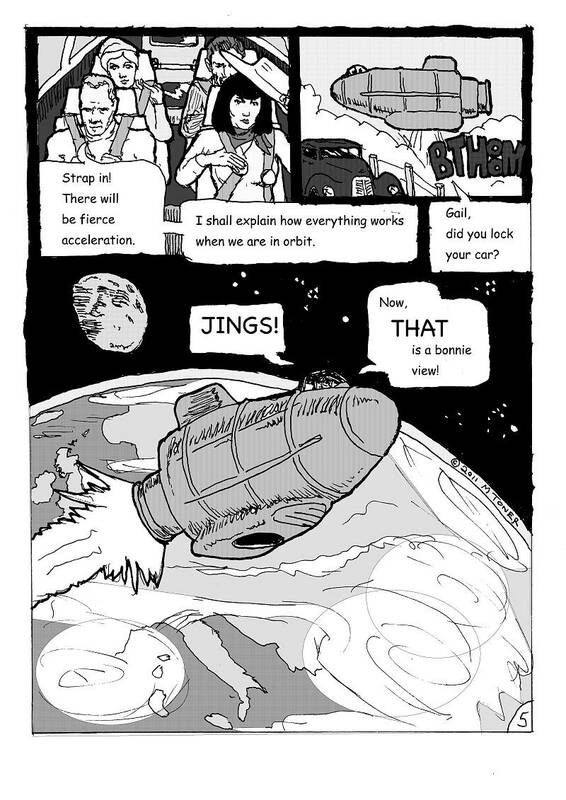 The art is a little rough around the edges and the lettering needs much improvement, but the story's chuntering along nicely - Mark's includes some humour in the adventure as the characters first experience space flight, for example, which all helps add to the fun. The strip's been running for a few weeks now, with a new episode from Dumfries-based artist Mark Toner every Thursday. "If you like the Gail Scott series and would like to put it on your site, email me," says Mark. "I'm always happy to help other impoverished web content providers as long as they let me approve the use. If you've got commercial plans for my comics, I insist on my share of the proceeds!" Describing himself as a "Comic artist, astronomer and guitarist" (check out www.twitter.com/ArbelosMusic for his band), you can check out more of Mark's comics work at www.spacepilot.co.uk. • All Gail Scott artwork and stories are copyright © 2011 Mark Toner, all rights reserved. This month the Manchester Comic Collective is doing something a little more special than its usual gatherings of creators for a friendly drink - along with the Sandbar, they'll be hosting the first Big Drink n’ Draw on the very first day of the Not Part Of Fringe Festival! As part of the Big Drink ‘n’ Draw they’ll have a little Comic Fair with tables set aside to sell indie comics, plus a few of table for creators with lots to sell and one communal table for anyone’s comics, minis or zines. Tables are free but limited, so visit the MCC web site and leave a comment to show your interest and they’ll be in touch! If you can’t make it but would like to sell your comics, please drop them off at Sandbar with a note saying “For the BIG Drink ‘n’ Draw”. As if that wasn’t enough Matt Badham will be hosting an informal chat and Q&A with Andy Diggle, writer of The Losers, Daredevil and former editor of 2000AD. The starting time for this is to be confirmed but will last about an hour. The MCC are hoping to have another talk with some comics professionals too! Names and times for that are still to be confirmed. The BIG Drink ‘n’ Draw will also be continuing late into the night. There’s a comedy event starting at 8.00pm and after that a short film night running through the evening, but all the while the DnD will continue in a reserved area of Sandbar with a big Comic Jam on a Wall. • RSVP on the Facebook Event page and see who else is attending! Join the Drink ‘n’ Draw Facebook Group while you’re there too, for updates of all future events. As Tom Strong and his family prepare to celebrate a wedding, the unthinkable happens: before their eyes, reality alters to become a world conquered by Nazis and ruled by Tom’s nefarious son, Albrecht. To restore the world he knew, Tom must journey back in time and seek help from the only man he can trust: himself. But will even two Tom Strongs be enough to stop the Robots of Doom? Chris Sprouse first met Alan Moore when he drew several issues of Moore’s script for Supreme. A year later, he and Moore created Tom Strong for America's Best Comics, for which Chris won two Eisner Awards in 2000, for Best Single Issue and Best Serialized Story. Taking over the scripting of Tom Strong, Peter K. Hogan started out as editor of cult political British comics Crisis and Revolver in the late 1980s and early 1990s, before working for 2000 AD and American comic book publishers Vertigo and America's Best Comics. 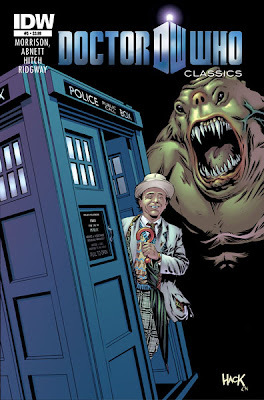 IDW's Doctor Who Classics series, now re-publishing the Seventh Doctor's adventures from Doctor Who Magazine has a 'first' and 'last' feel to Issue 5, on sale this month in the US. The collection sees the publication of 'Culture Shock', Grant Morrison's final Doctor Who comic story to date, but Bryan Hitch's first Who work - not that the accomplished artist would like to be reminded of it. With a new cover by Robert Hack and colouring from Charlie Kirchoff, also included is 'Echoes of the Mogor', a cracking spooky tale from Dan Abnett and John Ridgway. Grant Morrison, whose past Who strips included the hugely popular Cybermen origin story, 'The World Shapers', may have gone on to better known comics such as The Invisibles, All-Star Superman and X-Men but he has always been a Doctor Who fan. Might Grant one day follow Neil Gaiman and write a TV episode? Bryan Hitch, now well known for his stunning work on Marvel's Utlimates and Fantastic Four and more, would rather skate over his first ever Doctor Who strip, which he drew when he was just 17. "I usually encourage people to burn my early work," he pleads. Notable as the first appearance of Dan's Foreign Hazard Duty, a futuristic version of UNIT, Dan Abnett confesses that although he is “ridiculously good” at archiving back issues of his work, his Doctor Who Magazine collection seems to have disappeared into an alternate dimension, and, like Alan Grant, he has few memories of 'Echoes of the Mogor'. “I hope it’s a good one, and not an ‘Ooh, did I really write this crap” one,” he opines. “The funniest part of all is where working on DWM got me. I loved it, but I never expected to write for Doctor Who again. I tried to get a Virgin novel commission early on, and they didn’t even reply. I felt I was very much ‘not in the Who clique’ and had only been lucky enough to write for the good Doctor because I knew you and Richard. "Then, suddenly, in the last few years, it all came back to haunt me. Gary Russell came to me for a couple of Big Finish adventures, which led to the likes of my Torchwood novel and audios, and the Martha novel, and the Tenth Doctor audios for the BBC etc., and that train of events only happened because Gary had remembered how much he’d liked my DWM strips and came looking for me. At one point an FHD US title was considered, along with a number of other projects (including an Abslom Daak - Dalek Killer story by Steve Moore), but it was shelved after editorial changes instigated by Marvel Comics directors in America. Other IDW Doctor Who titles on sale this month are Doctor Who #6, written by Tony Lee (with interior art from Matthew Dow Smith, who also provides a rare variant cover, the other by Tommy Lee Edwards), which sees the start of a three-part tale, 'When Worlds Collide', featuring Sontarans, a rift world, cowboys and Romans. • While print editions of IDW's Doctor Who titles aren't officially available in the UK, you should be able to buy the digital editions of these comics. The ninth issue of the Temple APA digital comics showcase is now available to download as a completely free PDF file. 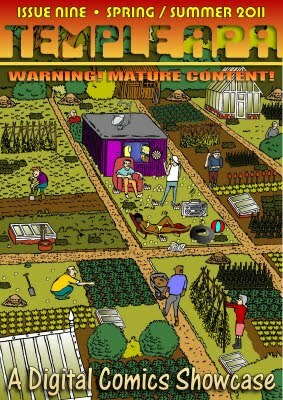 Featuring 48 pages of artwork and stories from a host of creators, including Tony Suleri, John Owens, Dave Hailwood, Dirk Van Dom, Matthew McLaughlin, Paul Eldridge, Malcolm Kirk and Simon Mackie, (who also provides the cover artwork, displayed above). Here's the list of Eagle Award winners, announced at the MCM London Expo over the weekend. Currently living in Rome, Sara has worked in the local animation industry as storyboard artist and character designer for a couple of years before taking a chance on the comic business. In April 2008 she was one the winners of the "Chesterquest" international talent search and since worked for Marvel Comics on titles like NYX, Eternals, X-Men Manifest Destiny: Dazzler and Runaways. She's currently working on the new X-Men: Pixie title. Grant Morrison is highly-regarded as one of the most original and inventive writers to work in the comic book industry. He is recognised as being one of the best-selling writers in the medium for the last 20 years. Dave is known for his work at Dark Horse Comics, DC Comics and Marvel Comics, as well as colouring Tim Sale's art in Heroes. "It goes without saying that everybody at Commando HQ was highly delighted [by this award]" says editor Calum Laird. "But it’s not all about the small handful of us here, the award is a fitting recognition of the work of all those who have put so much into the title over the last 50 years. It is their efforts that have made Commando so highly-regarded the comics world." "The Eagle Award is the British equivalent to the US Eisner award," says writer Ethan Nicolle. "The big difference is that the Eagle Awards nominated Axe Cop for best web comic and best cover, and awarded Axe Cop for one of those, whereas the Eisners didn't even nominate Axe Cop. That's fine, but let me just reisterate my appreciation for the love the Brits have shown Axe Cop... I really hope we get to come visit some day. Thanks to everyone who voted online for Axe Cop and all who were involved in honoring us with this award." Shame it's been cancelled, eh? 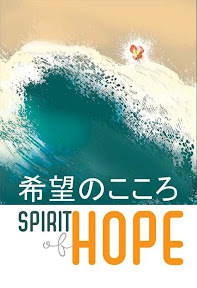 Britain's Comic Book Alliance will publish Spirit of Hope this month - a stunning-looking anthology featuring work by almost 100 comic creators in aid of survivors of the Tsunami and earthquakes in Japan and New Zealand which happened earlier this year. The anthology features 50 pieces of donated art from 92 top international creators in the comic book industry. The pieces are mainly sequentials or comic strips but there are also a few stunning single page pin ups. The brain child of the Comic Book Alliance, it's hoped that with all proceeds being donated, the project can raise over £30,000. 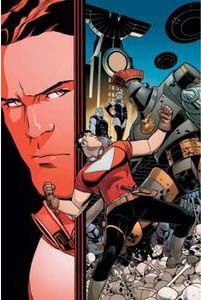 Edited by Alan Cowsill and Tim Pilcher, Spirit of Hope is being offered in two alternate covers - one by Jimmy Broxton (above), the other by Mike Allred (left). Creators involved include Natalie Abadzis, Nick Abadzis, Adrian Bamforth, Jasper Bark, Donna Barr, Jordie Bellaire, Paul H Birch, Bolt-01, Dan Boultwood, Mark Buckingham, Jim Campbell, Richmond Clements, Jason Cobley, Simon Coleby, Mike Collins, Martin Conaghan, Gary Crutchley, Glenn Dakin, Al Davison, Brandon DeStefano, Benjamin Dickson, Martin Eden, Mats Engesten, Gary Erskine, Al Ewing, Glenn B Flemming, Emma Flint, Henry Flint, Leigh Gallagher, Matt Gibbs, Gary Gilbert, Alan Grant, Jon Haward, Peter Hogan, Kev Hopgood, Graeme Howard, Inko, Rich Johnston, Ant Jones, GM Jordan, Jessica Kemp, David Leach, Tony Lee, Nigel Lowrey, Ciaran Lucas, Paul McLaren, Gary Spencer Millidge, Michiru Morikawa, Alex Moore, Leonie O’Moore, Michiru Morkawa, Eva Perkins, Grant Perkins, Martyn Pick, Maria Pickering, David Pugh, James Reekie, Regan, Neil Roberts, Darick Roberston, John Robbins, John Ross, Declan Shalvey, Liam Sharp, Akiko Shimojima, Si Spencer, Vicky Stonebridge, Lew Stringer, Steve Tanner, Archie Templar, S Thompson, Geoffrey D. Wessel, Chris Western, Andrew Wildman, WJC, Ant Williams, Rob Williams, Sean Michael Wilson and Yel Zamor. Copies of the book can be ordered in advance and will be £14.99 + £3.00 p&p. Anyone ordering should state their preference of cover: both will soon be available to be seen on the Comic Book Alliance website or Facebook page. Limited edition prints are also being offered to purchasers - check the sites for more information on these but one is a beautiful piece of art by Mark Buckingham (right). 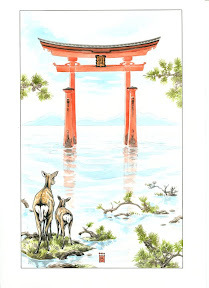 Other art and comics-related fund raising activities in support of this cause include Art Blossom Japan, where you can purchase the donated artworks of talented Manga/ Comic artists and Illustrators. 100% of proceeds go to British Red Cross: Japan Tsunami Appeal and IFAW Emergency Relief Aids helping fund those affected. Aftershock is another long manga/comic book being put together by Adam Pasion, an American artist living in Japan. Most of the creators involved in this project are American, and the stories are about Japan in general and what Japan means to each of the contributors. Despite disappointing sales for past comics exclusives, it seems newsagents WH Smiths haven't given up on the idea. Just released is this Beano Summer Special, produced in partnership with DC Thomson. 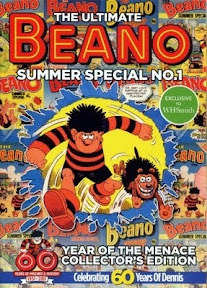 Ignoring the misleading claim that this is the first Summer Special - when any fule know Summer Specials were once an integral part of British Comics publishing - this is an impressive-looking A4 size softback book, consisting solely of reprints from, er, past Beano Summer Specials. Over on his great blog, Lew Stringer notes that the strips included feature the work of artists such as Davy Law, Dave Sutherland, Jim Petrie and others. But sadly it seems WH Smiths - recently getting some of the lowest customer ratings in a high street store poll by Which?, and not for the first time - are up to their usual antics, with fans reporting some stores are not stocking the title and some staff even denying its existence. This was the same fate that befell the Egmont exclusives in some stores when spcial Misty, Buster, Battle and Roy of the Rovers collections were released, so I do hope this problem isn't endemic across the chain. Sadly, though, the lack of staff awareness of WH Smiths' own product is an ongoing problem at almost every level of the company. When you complain to a local manager about magazine positioning or availability, they often don't seem to understand your points (or simply can't be bothered); and if you complain to head office they spout platitudes and nothing changes. The Beano Sumer Special 'Number One' costs £4.99 and is on sale now.